• Auto-release: With a quality electro-magnet the upper platen automatically releases at the end of the tie cycle, meanwhile the dual gas springs lift the upper platen gently with a smooth release. • Swing Away Design: The swing away design gives you a complete unobstructed access to the lower platen while working. Hassle free to load the garments and place transfers. • Auto-sleep Mode: The integrated digital controller offers auto-sleep setting mode with time setting range from 0-999 minutes. The machine will enter the sleep mode after a set time without any use or powered off at the controller. The machine will be reactivated by a touch on the controller or new use. • Over the center pressure Distribution: The pressure source is strategically placed over the center of the upper platen and use struts to drive that pressure out to all corners. The result is an even and heavy duty distribution of pressure that is unmatched by other heat presses in the market today. 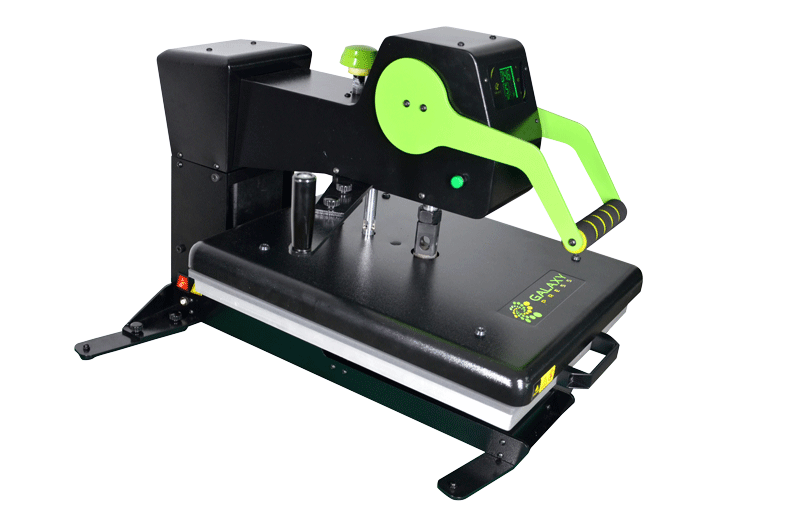 • Dressable lower platen: The special laser cut base allows users to dress garments over the lower platen without stretching the item. Simply load the shirt onto the platen and feed the bottom of the garment through the clearance underneath the lower platen. • Changeable control box: With quality aviation connector, the control box can be taken on/off easily. This helps with machine maintenance. • “RAMLOCK” Quick change system: With a self developed “RAMLOCK” quick change system, the customer can change multiple lower platens with different sizes easily.